This part of my file about Kenneth Arnold's observation on June 24, 1947, in the USA, is the booklet Arnold wrote, published at his own expense in 1950, and distributed around. It does not tell about his own sighting, it tells of the early days of the flying saucer reports. Arnold can be considered to have been the first ufologist. Needless to say, that I was suprised to hear from you, but very agreeably so. I know very little about Frank's accident, and what I do know I just up for myself. The War DEpartment has never given me any kind of statement as to what might have happened the night Frank was killed. I have tried to go over the meager details that I have from every angle, but they don't make a very complete picture. This Fate Magazine that you mentioned in your letter is certainly foreign to newsstands here in southern California. It must be a local magazine or one that is comparatively new because not even the magazine guide at the library has it listed. Would you please send me a copy of the magazine? I would like very much to read the article. Frank had discussed the flying discs case with me at great length, and he had told my why he was going to McChord Field the night he was killed. I have never thought that Frank's death was an accident. Frank said that you flew all over the country. If you are in this vicinity I would be more than happy to see you and talk with you. Be sure to let me know when you will be here and I will make arrangements to contact you as I have my time pretty well scheduled. I am taking a pre-medical course at Long Beach City college and am president of the pre-professional women's medical club on the campus besides keeping up an apartment, so you can see that I don't have too much extra time. I have tried to keep as busy as possible since Franks' death and have succeeded quite well. Any and all information you have regarding this matter will be greatly appreciated by me. THIS letter in itself is self-explanatory. Velma Brown is the widow of Frank M. Brown, counter espionage agent. "Skeptics" have argued that Arnold was "paranoid". Nothing indicates so far that he was paranoid before his June 24, 1947, sighting, but yes. he became very suspicious afterward. He did not know what were the objects he had seen, and began to thought that maybe the Army was hisiding things or trying to keep some secret. This is the reply by Velma Brown to Arnold. 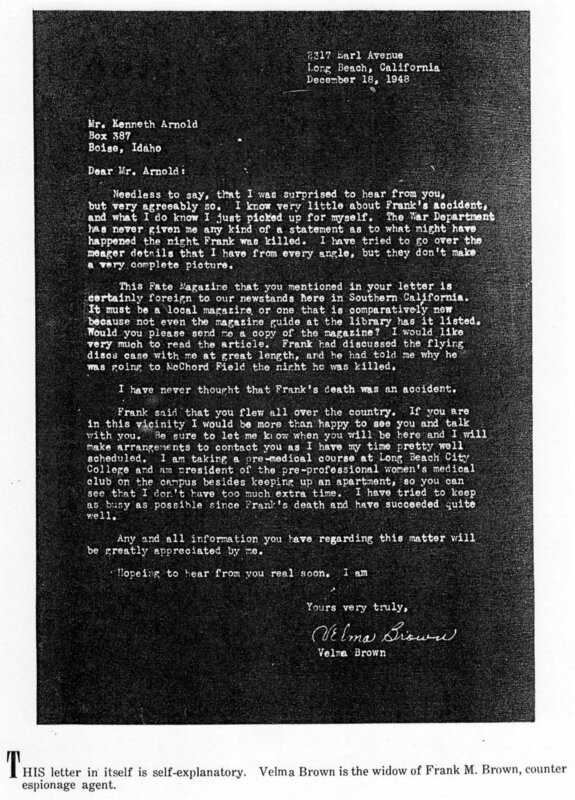 Arnold had contacted her about her husband's death, and it is Velma Brown, not Arnold, who writes that she "never thought that Frank's death was an accident". Frank, her deceased husband, was Counter Intelligence Corp agent Frank Brown. Along with CIC agent Davidson, he investigated the first flying saucer sightings, Arnold's, and other sightings. They were the first "military ufologists", so to speak. With Arnold, they had been investigating a story about a donut-shaped saucer allegedly seen near Maury island; this became known as the "Tacoma affair." The saucer leaked some "slag" that fell to the ground, were allegedly collected, and rumor said that these "remnants" of the discs were being sent for inspection in an Army Air Force plane in which Davidson and Brown took seat. But the plane crashed, mysteriously or not. Rumours that appeared in the local Press first inted that the plane carried debris of the Maury Island flying saucer - the Army said they had "no knowledge of that - and then some newspapers suggested that the plane crash was possibly not an accident but sabotage to preserve a "secret of the flying saucers"... Hence Arnold's attempt to discover what happened to the plane exactly.